"I have a feeling that this is the only possible name for this square. Not only that it comes from the church St. Kaharine on the square, or that Zagrebians are particularly fond of this church. It is from one completely different reason, this square is church itself! Square is narrow and elongated exactly as a church nave. In its far end baroque church is standing, in this case playing the role of altar. There is a main gate – entrance from the Vranicini field." 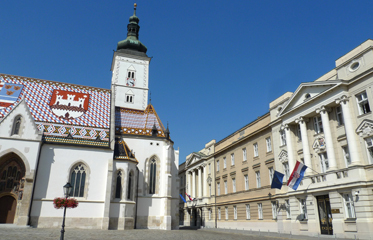 This square is in the hearth of very well restored "Upper Town" or historic Zagreb. Its religious character is emphasized by the presence of one more church visible in the distance and on the photo in the middle bellow, famous St. Marko church built in 1334. 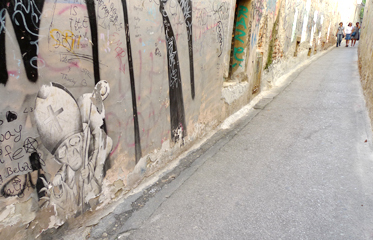 Small photos are from the same area of upper town Zagreb.